I have been visiting health retreats all over the world for 20 years now and Kamalaya had been on my wish list for well over 6 years, so you can imagine my delight when I was asked to fly to Thailand and visit Kamalaya as a mystery judge for the World Spa & Wellness Awards. The island of Koh Samui in Thailand has been health retreat central for over 20 years. In fact it was here that I went through my first 7 day fasting program back in 2000. It was also at this retreat that I attended my first yoga class and met my yoga teacher. Some years later I returned to the island for a second retreat and so when I landed at the airport I felt like I was coming home. The transfer to Kamalaya was smooth and within 50 minutes I was greeted into the lovely reception area for check-in. I was feeling wonderful already! I had booked a 7 night stay and after a busy year of moving interstate, studying interior design and work I was certainly ready to get my glow back on, and be an advocate for spa wellness. It was truly the perfect end to the year. My initial wellness consultation was thorough and my wellness advisor was exceptionally helpful with explaining certain speciality therapies on the spa menu. From there a plan was made and soon thereafter I arrived to the spa reception for my first treatment, which was an Ayurvedic Marma Point Massage, ideal for grounding and balancing. I had now arrived into my body and could already feel this was going to be an amazing week. Perched on a steep hillside that drops down to the sea and a private beach, I found myself feeling expanded and yet still. Whichever way I walked required some incidental exercise, along with some detoxification due to the sweating that naturally happens in the humidity of Thailand. In addition there was a daily schedule of classes that included yoga, meditation, pilates, aqua aerobics and some other things. I loved using the fitness centre and running on the treadmill with its spectacular view over the water and I also loved dancing freely in the yoga pavilion that sat on top of the hill. I hold this in my memory as 'my special place'. The food philosophy was absolutely perfect and I could not fault a single item. It has been carefully planned from all angles and whether one follows a vegan, raw, ayuvedic, TCM or paleo diet the menu and breakfast buffet had it all. The food was always beautifully presented, full of life, vitality and colour and of course delicious. It was such an inspiring culinary experience that I would return for this alone. The restaurant featured private tables along with a communal dining experience which is fabulous when travelling alone or if you are wanting to meet other wellness travellers. The spa and wellness menu is amongst the most comprehensive you will find anywhere. The approach to healing for mind, body and soul is available via a myriad of treatments to choose from. In addition, Kamalaya hosts some of the worlds best healing practitioners who offer their own specialty therapies, which ensures this spa menu will never be boring, and nor will your journey back to self. 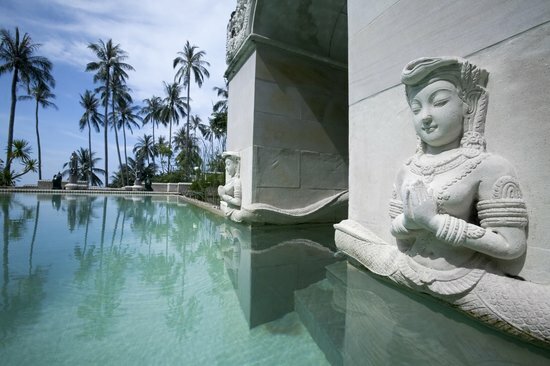 Finally what I most loved about Kamalaya is the pure intention that it was built upon. Created by John and Karina Stewart, this is a tale of love. They met at the feet of their Guru in India and from there became good friends. John was living in a Himalayan ashram at this time, and Karina was living in the USA and a practicing Chinese Doctor amongst other things. Some 11 years later John was told that it was time for him to leave the ashram and go into the world. He called Karina and with a shared vision they soon married and began the task of finding the perfect location for the retreat they imagined. During this time they met Marc Cornaz, who brought his exceptional experience as a hotelier to the development of the retreat so that today Kamalaya offers a luxury 5 star experience that rivals any other luxury resort. Kamalaya offers an experience that touches mind, body and soul. I absolutely loved my week here and hope to return some day in the not too distant future. Posted on December 2, 2016 by Sonja Sorich and tagged kamalaya health retreat thailand detoxification wellness mind body soul wellness spa destination spa yoga meditation spirituality luxury resort healthy food.